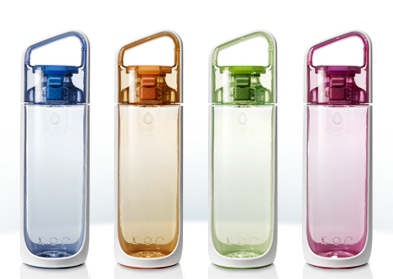 Anyway, in my desperate bid to find a unique water bottle, I found Kor Delta Hydration bottle by googling "unique water bottles". And this has been one of my best purchases ever since. This water bottle is very easy to open. See those two buttons in the middle? It's a push button cap. You just have to push it up(to open) and down (to close). When it's closed, even if you turn it upside down, it will not spill. The cap is totally removable, so it's also easy to clean. This is my favourite part of the bottle. You know when I said I don't drink a lot of water? Well, since I've had my Kor Delta, I have been drinking a lot more! Maybe around 1.5 to 2L. You know why? I keep telling Don this. When my lips touches the rim, it feels like I am actually kissing the softest lips on earth. Seriously. And when I finally drink the water from the bottle, it's sooooo refreshing. All of a sudden, the water tastes different. Most importantly, it doesn't smell of plastic. And yes, on top of the cover, there are actually two "stones" which you can choose from - for inspiration (to drink more water). The green bottle comes with the"Be the Change" and "Imagine" stones. You can just alternate them by opening the cap. Generally, I can't live without a water bottle in my bag because my throat dries very easily. While I always had bottled water before, now I have my Kor Delta. It fits perfectly in most of my bags. By the way, I have the 500ml bottle. They also have 750ml bottles. Promise, it's not heavy. If you're in the Philippines, you can buy them from Sunny Sunday. I know it's quite pricey, but I can guarantee you that it is worth it, and you probably will never go back to drinking from a bottled water again. Be inspired to "Go Green".